Elland Road has been the permanent residence of Leeds United AFC since the club's foundation in 1919. The stadium is the 10th largest football stadium in England, and the largest ground outside the Premier League. The East Stand runs the length of the east side of the pitch and is the most recent stand in the stadium. On completion it was the largest cantilever stand in the world, holding 10,000 spectators in the lower tier and a further 7,000 in the upper tier. There are very few bad seats in the house and the passionate home support means there's very rarely a lack of atmosphere. 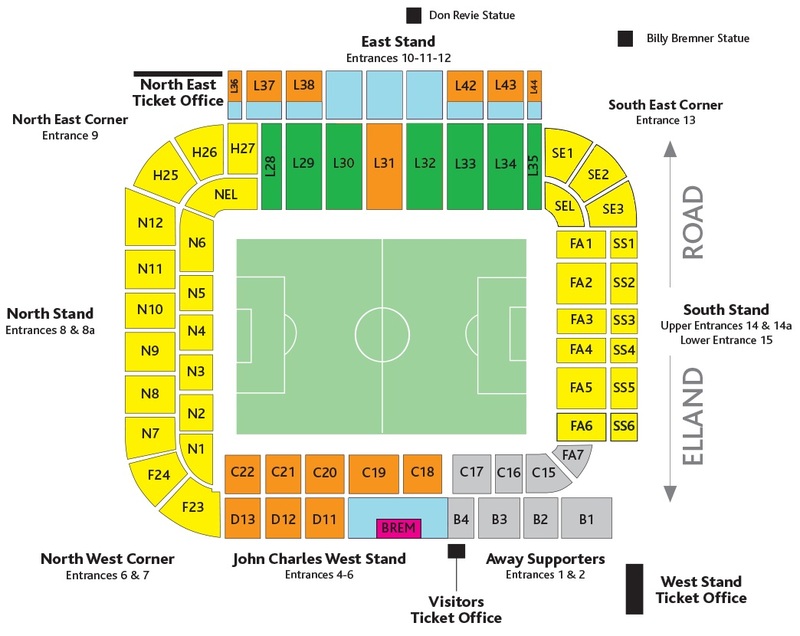 Visiting supporters are situated at one end of the upper tier of the John Charles West Stand. Occasionally, for some local derbies, and well supported clubs, the whole of the West Stand upper is given to away supporters. The general allocation is 3,000. Views from here are very good and are pillar free, whilst the leg room and facilities are adequate. The nearest pub is the Old Peacock which is just behind the South Stand. It is for home supporters only. The Dry Salters pub caters for both home and away fans, and is about a 10 minute walk away from the stadium. With the Old Peacock behind you, turn left and follow the road down to the very end. You will pass a number of entrances to car parks. Head under the railway bridge. At the end of the road turn left along the dual carriageway and the pub is a little further down tucked in on the left hand side. Car parking is freely available at the stadium in two very large car parks across the road. These are priced at £5 per car but from experience can take a fair while to disperse if you're not quickly out of the stadium and back to your car. Car park A is advised as the easiest to escape from as the fans coaches are usually placed in there and therefore less traffic will be trying to escape at the same time as you. The nearest / closest train station to Leeds United's Elland Road stadium is Leeds. It is however, approximately 40 minutes by foot from the train station to the ground. You have a number of options though, such as, a taxi from the rank outside the station. This can cost approximately £6 but will get you there safely and quickly. Another alternative is to catch one of the bus services that run direct from the train station to the ground. The shuttle buses run from the street below so exit the station and cross over before taking the stairs down and the buses will be queued ready to go on the right hand side. The buses drop you off on the corner of the East and North stands. Travel: One of the easiest grounds in the world to get to. Got the coach the first two times, but drove the third. The ground is visible from the M621 between junctions and 1 and 2…come off at either and you're right next to the ground, and away in minutes afterwards. Refreshments: Inside the ground is pretty tight and the queues as a result are ridiculous. One thing Leeds do have though that I've never seen anywhere else before or since is vending machines… such an obvious solution to so many problems with getting food and drink at half time, yet nobody else does it! Outside the ground, not an awful lot but a few chip vans and stuff. Impressions: Have sat in three different away areas at Elland Road, the South Stand was unbelievably shallow and tight, made all the worse by the fact I was sat next to a 7 foot giant who struggled to sit down once he'd stood up! The ‘Cheese Wedge,’ despite being a lot smaller, actually has the better facilities, with more legroom and much roomier downstairs. Didn’t seem as shallow either. The legroom in the South and West Stands is horrific, and nowhere near enough space under the stand to let people move around. One of the most claustrophobic experiences of my life, and it took us longer to get out of the stand, than it did to get out of the car park afterwards, which says a lot I think! Atmosphere: The ground was half empty on all visits, so we got nothing from Leeds fans on both visits. (Except for one Peter Ridsdale lookalike getting a bit irate at the abuse he was getting at the FA Cup game!) It was better admittedly in the League Cup game, Leeds playing better and seeming a bit more up for it than on my previous visits, but it looks like the acoustics are shocking at Leeds, as it was one of those where you could see the Leeds fans getting excited and moving around as they were singing, but could barely hear them. From the away end, the atmosphere was great, over 3,000 of us in the first one, which was one of the best away atmospheres I've been in the middle of anywhere. The FA Cup game slightly more low key, given there were only 250 of us rattling around a ground less than half empty! Likewise again, it was understandably good at the Everton game as there were 5,000 of us… though. God knows why we bothered with a performance like that! Enjoy: It doesn't feel as big as it is, because the East Stand is so massive compared to the rest of it. As such, it doesn't really have the grandeur you would expect it to. 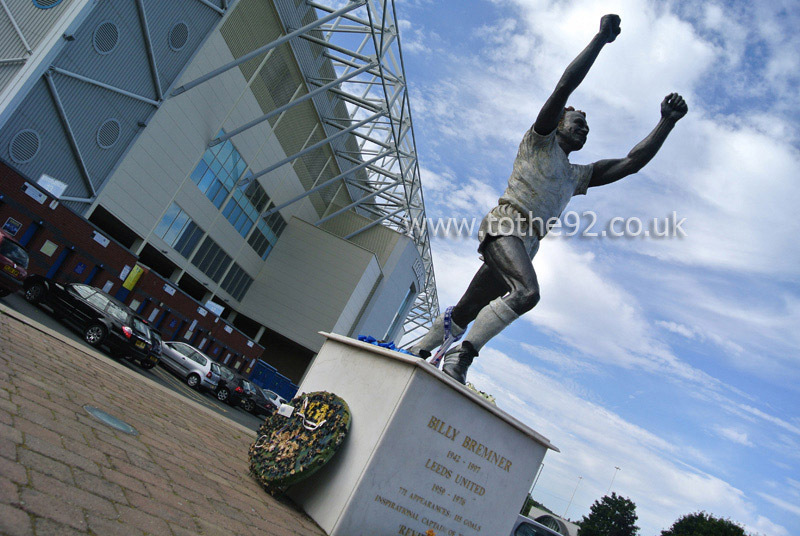 Have you been to Leeds United's Elland Road? To tell us about your experiences and to feature on the site, simply complete the fans review form below!